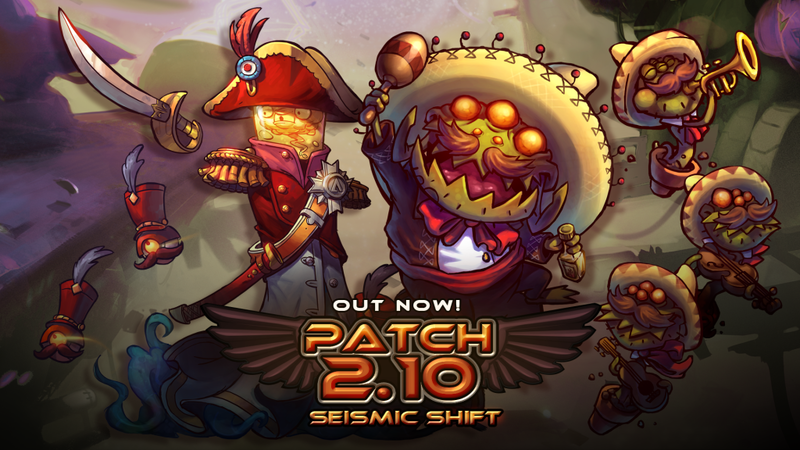 Update 2.10: Seismic Shift is here! The new update is now live! If you haven’t done so, fire up Steam and watch it grab the new version automagically. As we’re continously pushing Awesomenauts forward, 2.10 is a kickass new update that improves existing elements in a big way while also adding some new cherries to the pie. Both the adjusted Sorona and the overhauled Voltar will give everyone more flexibility in approaches and playstyles. Our hottest map, Sorona, has a slimmed down midsection which drastically improves the pushing experience. It also received new openings in the jungle areas, making defending and attacking that last turret a lot more fun. Voltar got the biggest changes however. All skills of this classic character have been completely overhauled while retaining their original spirit. With a new dual targetting base attack, individually launchable attack drones and a sweet bursting healpot, Voltar truly remade himself. He had the technology, as he told us many times. Additionally, the replays also received some kickass new features: Kill-Cam and Replay-to-Video. Enabling players to quickly view their proudest moments as well as their most embarassing. After which they can render them to a video and share them with the world! As for the cherries, I think we can all agree the new skins are both Awesome! Voltar Bonaparte make Voltar the cunning ruler he was always meant to be while Gnariachi shows off the amazing musical talent of Gnaw and his amazing Mariachi Weedlings. Check him out in the video! For a more extensive list of details on this update see the Vault. And for a full list of everything that has changed see the Patch Notes.